Long, straight, premium quality, costume wig, with pig tail braids and bangs, inspired by the Anna Character from the film Frozen. Glamorous long wavy shag hairstyle with bangs. 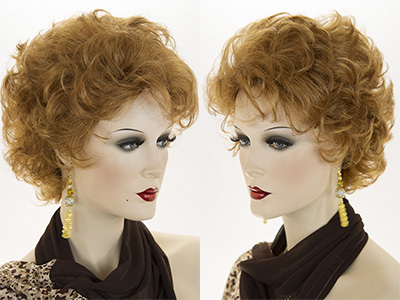 This stunning wig is 29 inches in length. See item details for available colors. Short, wavy, curly, pixie, tapered nape with long wavy sideburns. 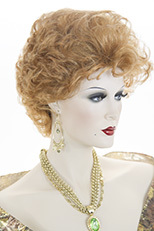 The hair length is approximately 3 inches throughout and tapers shorter at the nape of the neck. 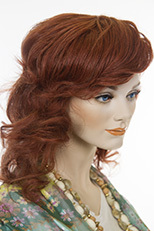 The tendrils on each front side fall to 3 1/2 inches for a feminine face framing effect. Please see item details for available colors. 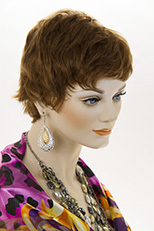 Striking wavy, short length premium quality, lightweight wig with soft carefree layers. This chic bob has flipped up ends. See item details for available colors. Premium quality, medium length, glamorous, lace front, natural looking hairline,heat o.k. wig! Length of hair is 12 inches. The hair is made from the finest Futura Kanekalon fiber. 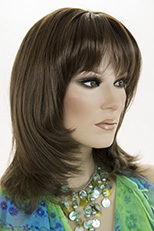 Futura by Kanekalon enables you to re-style and change your look effortlessly. Curl, flat iron, blow dry and re-style again and again. Futura’s breakthrough high heat resistance technology can safely handle temps up to 377°. See item details for available colors. Please allow one week for special order colors. 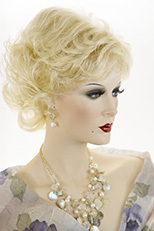 Glamorous and feminine! Long, straight, wavy hair, which is 18 inches in length. Featuring, a natural looking skin top. See item details for available colors. Sleek, long, straight face framing hairstyle! Featuring a natural looking skin top and bangs. See item details for available colors. Two long, wavy, bendable wire foxtails of hair, 15 inches in length, attached to a single plastic comb. Perfect for creative hair styling! You can bend the wires in any direction for complete control of the hair. Attaches securely to your own hair with a plastic comb. See item details for available colors.